By now, it’s almost common knowledge that the world of cryptocurrency is an exciting one, and that the value of cryptos is not something one can take for granted on a daily basis. Apart from issues with scalability, the volatility of the crypto market seems to be the main deterrent for future crypto investors. Maker (MKR) is a smart contract platform deployed on the Ethereum blockchain that aims to change all that. The main goal of this project is to stabilize the value of a bond known as DAI with the help of smart contracts called Collateralized Debt Positions (CDPs). In order to comprehend how the platform works, you first need to understand its dual coin system. 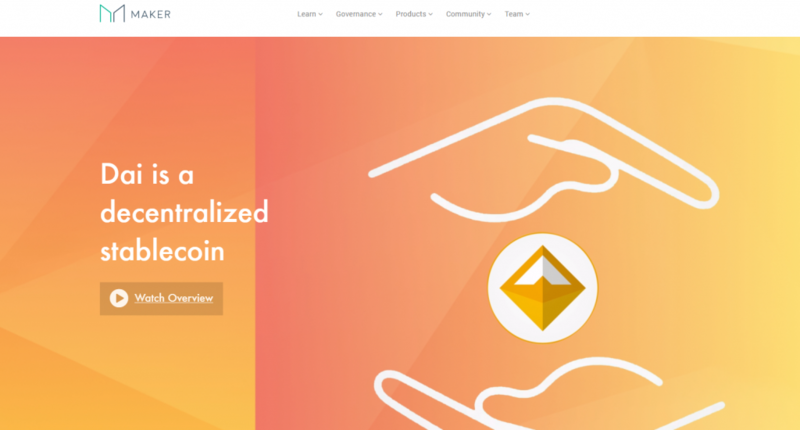 In short, the Maker platform has two official coins, namely Makercoin (MKR) and Dai (DAI). MKR is a token used to govern the platform as a whole, and its price is volatile. On the other hand, Dai is a coin suitable for payments, savings or collaterals and it boasts a very stable price. In short, Dai is here to ensure that the cryptocurrency does not suffer from immense volatility and huge value fluctuations. Dai is a decentralized stablecoin and, due to its unique properties, it proves itself especially useful for four markets: the gambling market, financial market, international trade, and for transparent accounting systems. According to the project’s whitepaper, if the need for Dai increases on the network, so does the CDP, resulting in a greater number of MKR. The value of the Dai is pegged to the US dollar. This means that 1 DAI = 1 US dollar. MKR has three main roles on the platform, as it acts as a utility token, a governance token, and a recapitalization resource. MKR can be used to pay various fees associated with the generation of Dai. Each time a fee is paid, the MKR is removed from the chain. In short, the MKR supply will decrease as MKR is being burned. Conversely, if the demand for Dai increases, then the demand for MKR should also increase. Users who hold MKR can vote on the Maker system. The voting system is based on a continuous approval voting. This system allows any MKR holder to vote any number of proposals. MKR holders are also provided with the possibility of adding the new proposals on the network. The proposals with the most votes are the ones that can be used to change the risk parameters on the system. As far as using MKR as a recapitalization resource goes, the process is quite straightforward: the system automatically creates new MKR tokens and sells them to the market each time the collateral portfolio is being under-collateralized. In order to interact with the platform, users must create a collateralized debt position. This is done by leveraging Ethereum in Maker’s Collateralized Debt Position. The second part involves users having to execute a transaction to fund the smart contract. The amount of collateral used will be also used to generate the DAI. After creating the CDP smart contract and depositing the collateral, the respective users perform a transaction in order to retrieve the DAI they want from the CDP. Once the DAI has been acquired, the user cannot withdraw the collateral until the debt is paid back. In order for a user to gain possession of their collateral again, he or she must pay the debt and the interest, the so-called stability fee, which grows daily. The MKR is removed from the supply chain only after the full debt is paid. Since both MKR and Dai are standard ERC-20 tokens, you can store them both on any ERC-20 compliant wallet. A very good wallet for storing MKR and DAI is MyEtherWallet. If you’re a very security-oriented user, then hardware wallets are better. Ledger Nano S and Trezor are some of the best hardware wallets for storing MKR and DAI. If you want to invest in Dai, you will have to acquire the tokens by buying them. Since DAI is a “decentralized stablecoin,” it will most probably represent a very good investment opportunity. Currently, DAI is ranked 159th on CoinMarketCap with a total capitalization of $51,063,147 and a circulating supply of 51,498,879 DAI. According to the same website, the best sources for exchanging DAI are OasisDEX, Bancor Network, Radar Relay, Bibox, and Kyber Network. For more information, make sure you visit the Markets section. MKR is ranked 39th on CoinMarketCap with a total capitalization of $341,913,341 and a circulating supply of 618,228 MKR out of a total of 1,000,000 MKR. MKR can be purchased from some of the most popular exchanges out there such as OasisDEX, BitMart, Gate.io, Bibox, GOPAX, and OKEx. More information is available on the Markets section on CoinMarketCap. MKR is regarded by many crypto aficionados as the first “smart” cryptocurrency for its ability to eliminate most of the fluctuations of what is a very unstable market. If one were to invest in Bitcoin or Ethereum, one would invest in two coins that don’t have a lot of value stability, even though their prices are expected only to increase. 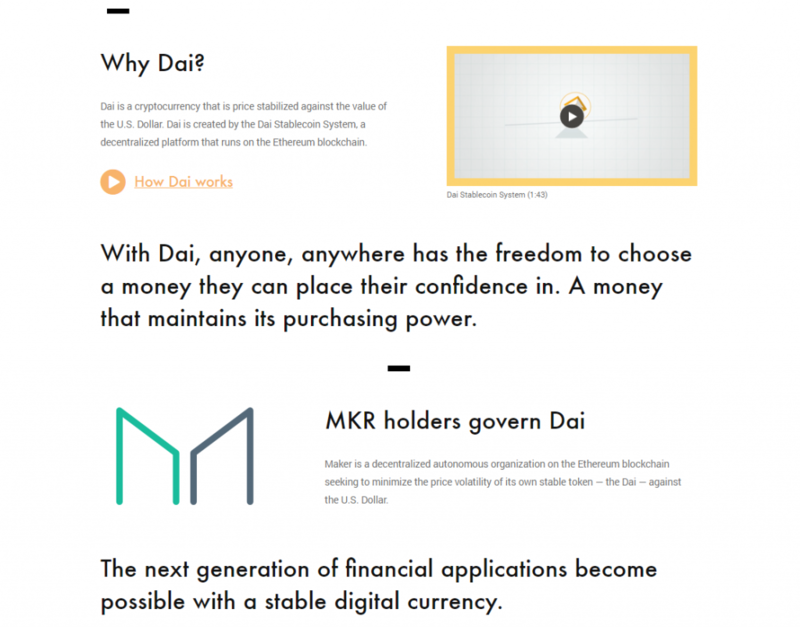 With DAI and MKR, you would invest in two tokens that have very stable prices. There’s no denying that Maker is a very interesting platform that shows a lot of potential. Maker’s Dai provides a very suitable stablecoin substitute, and the whole system is decentralized and trustless. The future for Maker looks bright, and it’s expected to catch the eyes of more and more investors over the following period. For more information about this project, you can visit the official website, as well as the platform’s subreddit, blog section, and Twitter channel. Other important news and useful guides can be found on the platform’s Telegram channel as well.